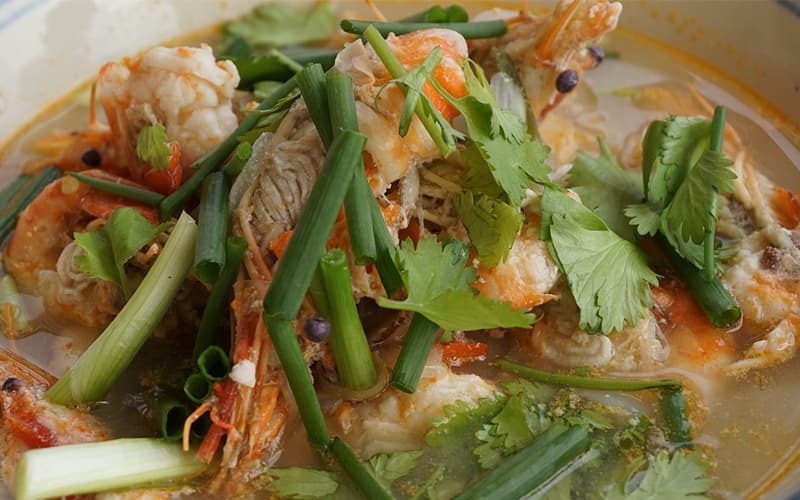 It is a delicious Thai soup with shrimp as a main ingredient full of quintessential Thai aroma! This masterpiece soup is cooked with shrimp, refreshing blend of fragrant lemongrass, galangal, chilli, lime leaves, tomatoes, mushrooms and shallots, giving it its legendary herbal taste. If you do not like spicy, do not forget to ask for a “mild” version. If you do not like seafood, just forget it and go ahead to next dish! If you are seafood lovers, you are having a wonderful start into your Thai food experience. The distinctive smell invigorates sour-spicy-hot taste just screams 'Thailand'. Along with Tom Yum Goong, Tom Kha Kai is also one of the most famous Thai dishes. However, compare with Tom Yum, it is mild and gentle. This iconic soup infuses fiery chilies, young galangal, stalks of lemongrass, thinly sliced and tender strips of chicken. Because it is unlike Tom Yum Goong, lashings of coconut milk soften its spicy blow. On the soup, there are some fresh lime leaves, smelling sweet, creamy and compelling. 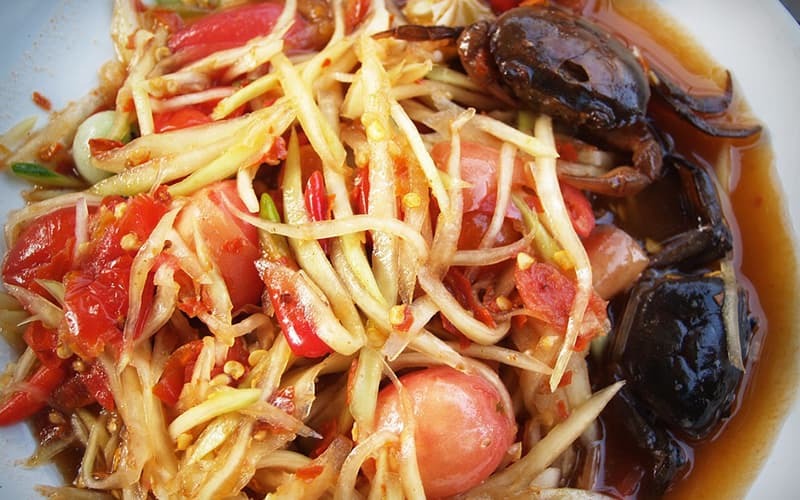 This greatly distinctive dish is from the Northeast state of Isaan. It is also an interesting dish. Some people never get enough of its bite, but some can't handle it. Garlic, chilies, cherry tomatoes, green beans and shredded raw papaya are dramatically pulverized together, releasing a rounded sweet-sour-spicy flavour that's not easily forgotten. It is variational in different places, some throw salted crab, dry shrimp or peanuts into the mix that catches many newcomers by surprise. 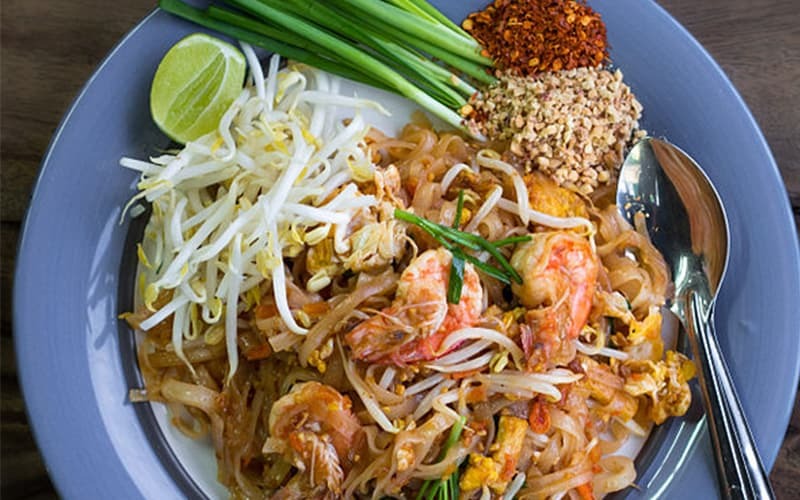 Pad Thai is street food served at local eateries that you can find it from Cape Town to Khao San Road. It is not served at restaurants, but the street versions are always better. Pad Thai is not spicy, it is sweeter and sour flavored. The noodles thin or wide noodles (you choose), are cooked with onion, egg, and crunchy beansprouts. The famous Thai fired rice caters to all locals and tourists all around the world. It is can be eaten at any time of the day, breakfast, lunch or dinner. The ingredients are pretty simple: rice, onion, egg, some cucumber and a few herbs- nothing more, nothing less. The secret of this delicious dish lies in its simplicity and it is easily found at many street vendors. Thanks to the Mekong River. It brought abundant source of freshwater fish to Thai people. They have created an amazing dish of Plah Kah Pung Neung. A whole snapper will be absorbed in green chili sauce, garlic with cilantro and lime leaves. Then the fish will be streamed in the tangy lime juice sauce on a metal fish pan. The fish is sweet, soft and aromatic melted on the tip on your tongue. Gaeng Daeng is a colorful, spicy and delicious curry that deeply loved by Thai people. Made with a little of meat, curry paste and smooth coconut milk with some spices and herbs of garlic, chili peppers, shallots, shrimp, galangal, kaffir lime and fish sauce. It could be like a beautiful lady: it is mild, sweet and delicately fragrant. Gaeng Keow Wan Kai is one of the most famous and sought after dishes of Thailand. Green curry paste, morsels of fresh chicken, coconut milk, cherry-size eggplants, bamboo shoots, Thai basil and herbs as galangal, lime leaves, all these elements make this curry an unforgettable blend of delights. It is usually served together with a bowl of fragrant Thai rice. Cashew nuts are abundant in southern Thailand, so this dis was born. It is one of the most popular dishes in Thai restaurants, especially loved by travelers from western countries. The main ingredients are stir fried chicken and roasted cashew nuts alongside sweet soy sauce, chilies, onions, pepper, carrot and mushrooms. All of these makes it a Thai specialty and the most important is that this dish is simple but delicious. Khao Niew means 'sticky rice' in Thai while Ma Muang means 'mango'. It is one of the most famous dessert that nearly everyone loves it and it can be found throughout the country. 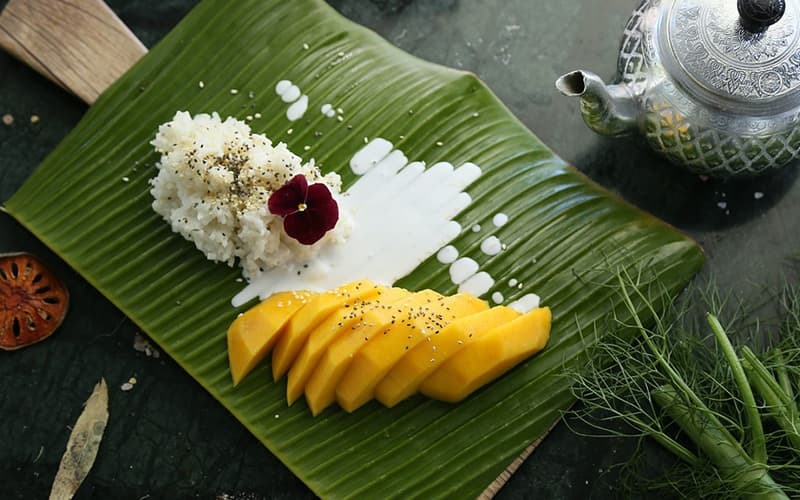 A layer of super soft glutinous rice is placed under some slices of super sweet, non-sticky, ripe mangoes with a mixture of coconut cream or milk on the surface. It tastes like a tropical rice pudding while the soft mango provides a fresh and natural palate reliever. You can easily found it on the streets and more upscale Thai restaurants. You will never go wrong by ordering this dish and it's a favorite amongst locals. It is also a very good choice for young children as the sweetened sticky rice is soft and easy for little ones to chew, what more, the slices of mango are very fresh and healthy and you will be assured that the children ate a serving of fruit. Just be careful, it is too delicious that they are unwilling to share with you and you will have to order your own. Fortunately, Kao Niew Ma Muang is not as expensive at traditional Western desserts, which is only cost around US$2. Food and drinks are very important part of the journey especial in this food paradise-Thailand. However trying to find a right restaurant is not always easy when you are travelling. That's why UME has prepared a Thailand Classic Culture Food Tour you will have opportunity to taste lots of mouth-watering authentic Thai food. Even if you do not focus on food, our local guide are happy to introduce some authentic food and restaurants for you. We also can tailor-made your own trip. Just tell us what you want to try or sample then we will tailor your tour, and we will make it happen.